← Name Whistler’s history – Florence Petersen’s book has a title! 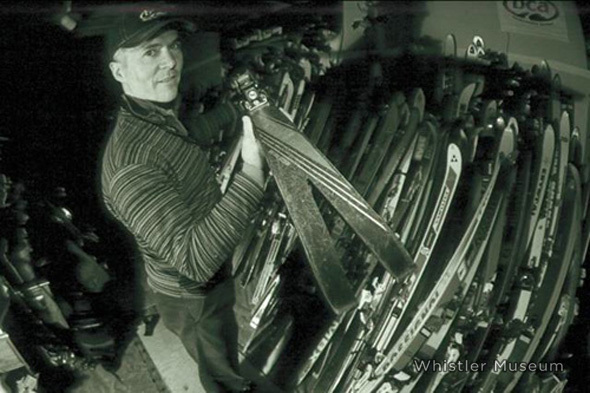 In April 2011, we had the chance to sit down with well-known Whistler local Frank “Garage Sale” Salter and talk all things ski. As we head into our next Speaker Series evening featuring Frank, it’s the perfect time to share a post on this avid ski collector. Frank shows off one of the split tail skis in his collection, photo courtesy of Frank Salter. Most of his ski collection is stored in a Creekside basement (he has recently taken over the adjoining space as well), although one can find a few pairs adorning the home he shares with his wife and two sons in the form of coat racks. When he started collecting in earnest in 1991, Frank set his upper limit at four dollars, although he admits to spending a bit more at times. His work in medical research fed his habit, as he travelled for a job that saw him finishing work by around four or five pm. Local thrift shops remained open for an hour or two after that- plenty of time to grab a few new pairs of skis for the collection (a collection which today sits around 500 pairs). 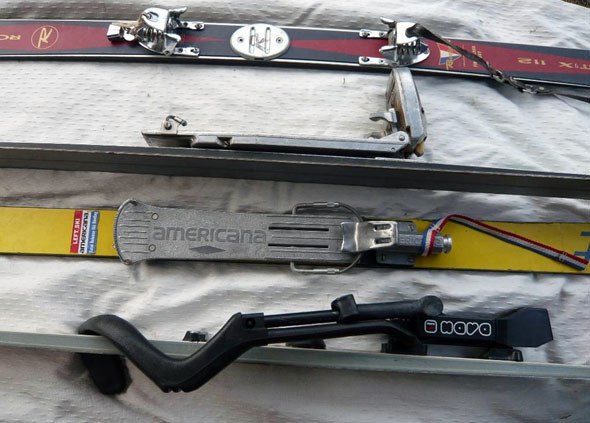 In the 1990s, you could travel with your skis for free, and so bringing multiple pairs of skis back across the border on your flight wasn’t a prohibitively expensive prospect. Of course, had they known that Frank was significantly exceeding a single pair of skis, it may have been a different story. Armed with a screwdriver, he would remove the bindings and then stack multiple pairs of skis in a ski bag. Today, Salter’s collecting has slowed somewhat. According to him, in spite of Vancouver’s proximity to good skiing, collectible skis are rarely to be had in local thrift shops. Some pieces from the more obscure corners of ski-gear world can be found in Frank’s collection, including the Nava and the Burt binding. The Navas are immediately jarring to the eye- in his words they look like, “some sort of bizarre device, almost a torture device.” You may not immediately notice the Nava from the front, but if get behind someone on a t-bar skiing on them and the wrap-around arm will be visible. A combination of a soft boot, much like a Sorel boot, and this arm made for a skiing experience that was much like sitting back in a reclining chair. The Burt binding was less noticeable, unless you were to fall, and then a cable would initially allow the ski to separate from your foot, and then sharply recoil, snapping the ski back against the base of your boot. Sound questionable? Urban legends point to these bindings as the stuff of some gruesome injuries. While that may or may not be true, there is something to be said for keeping these tucked away in storage. That being said, some pieces of ski history still make it out onto the snow. When we spoke, Frank was having some of his 70s freestyle skis tuned for the notorious “Hot-Doggin’ Party” thrown by Ace MacKay-Smith at the end of each April. Ballet skiing competitions are a part of the fun, and Salter provides the skis as well as some eye-catching one-piece ski suits to those who approach him. One white suit features a particularly stunning large Elvis-style buckle at the waist. That’s not to say that experimentation didn’t happen prior to the 1970s- some of Salter’s favorite skis in the collection are aluminum skis from the 1940s and 1950s. Aircraft-industry grade aluminum was used to craft the edges, bindings bases- the whole ski. According to Frank, “They didn’t work, and they were stiff as a two-by-four, but they were still expensive at the time, and they were a good prototype.” Once he started collecting in earnest, he quickly hunted down a few pairs of his first good skis. He suggests that it is those skis that people really feel attached to- not their very first pair, but their first good pair, the pair that made them truly fall in love with skiing. So where did Frank get his nickname from? While the nickname “Garage Sale” immediately conjures up images of Frank buying skis for the collection, the nickname actually stems from the telemark skis he made for himself and his friends in the early 1990s as he transitioned to a life in the mountains. Telemark skis weren’t readily available at that point, but in Frank’s hands, five-dollar garage-sale skis morphed into ripping tele skis. An article written by Leslie Anthony gave him the nickname, which quickly stuck. Join us on March 21st from 7-9pm for Frank’s Speaker Series presentation. All the details can be found here. 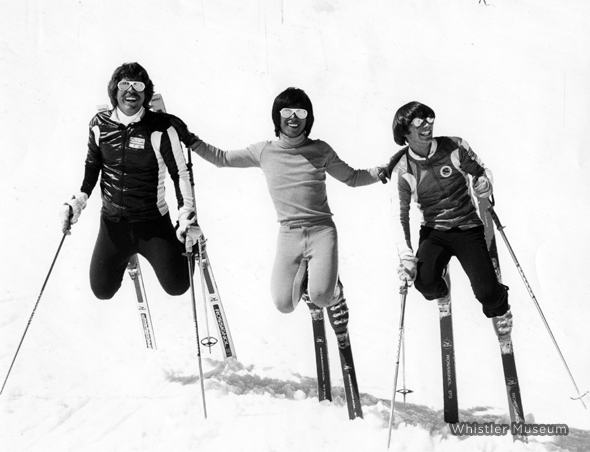 This entry was posted in Characters, News & Events, Skiing and tagged 1970s, 1970s skiing, Burt binding, Floyd Wilkie, Frank Salter, George Oskwold, Nava binding, Skiing, Wayne Wong, Whistler, Whistler Museum, Whistory. Bookmark the permalink.